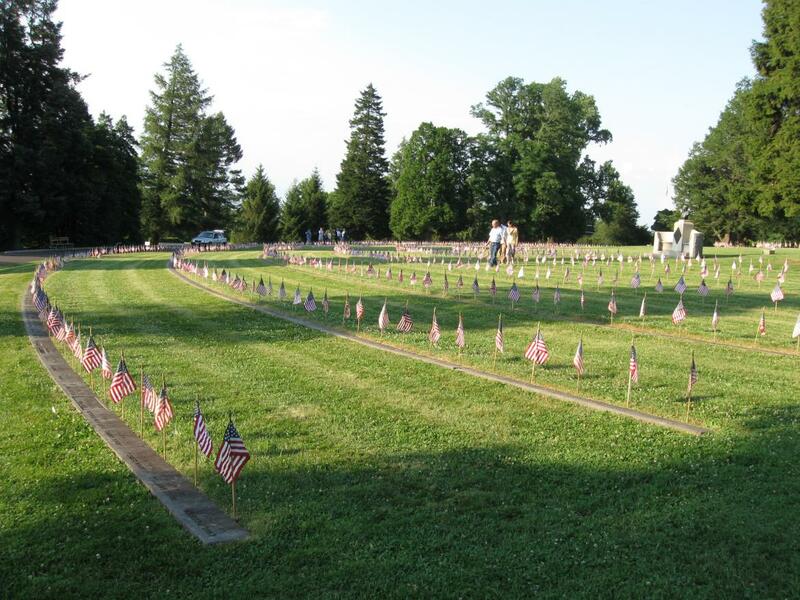 Tuesday evening, over 3500 United States flags were placed in the Gettysburg National Cemetery to honor those Civil War soldiers buried there. 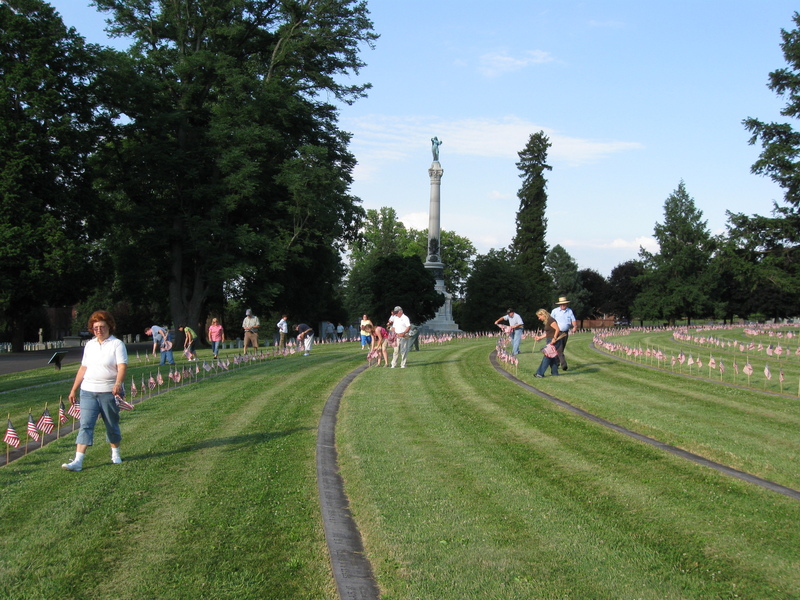 The Soldiers National Monument is in the background. 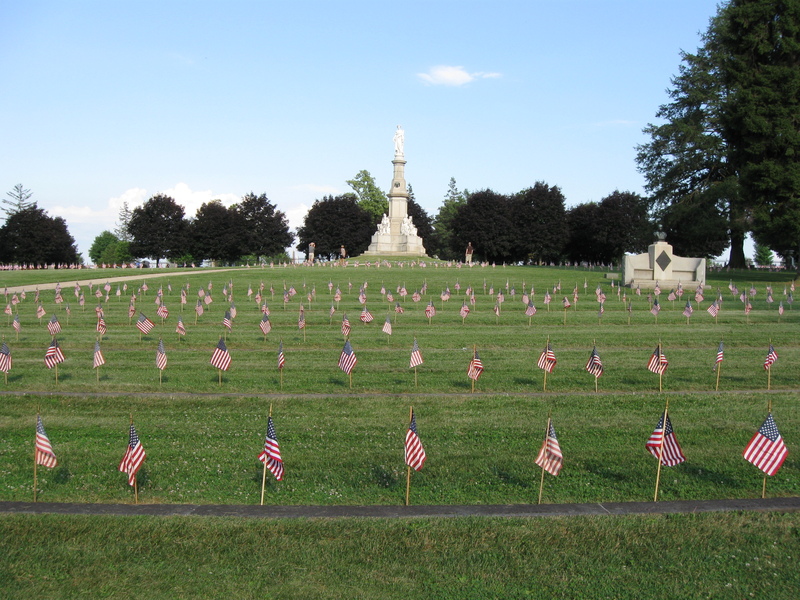 The flags in the foreground are in the New York section. This view was taken facing southeast at approximately 6:30 PM on Tuesday, June 30, 2009. 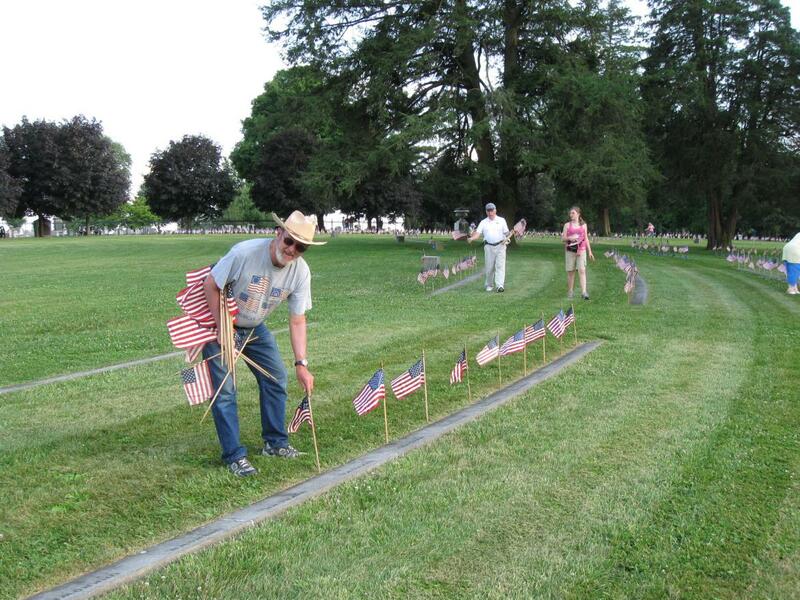 In a what has been a tradition since 1988, Gettysburg Licensed Battlefield Guides and some friends, families, and visitors placed flags in the Gettysburg National Cemetery Tuesday evening. The guides place the flags on the anniversary of the battle and for the Fourth of July. 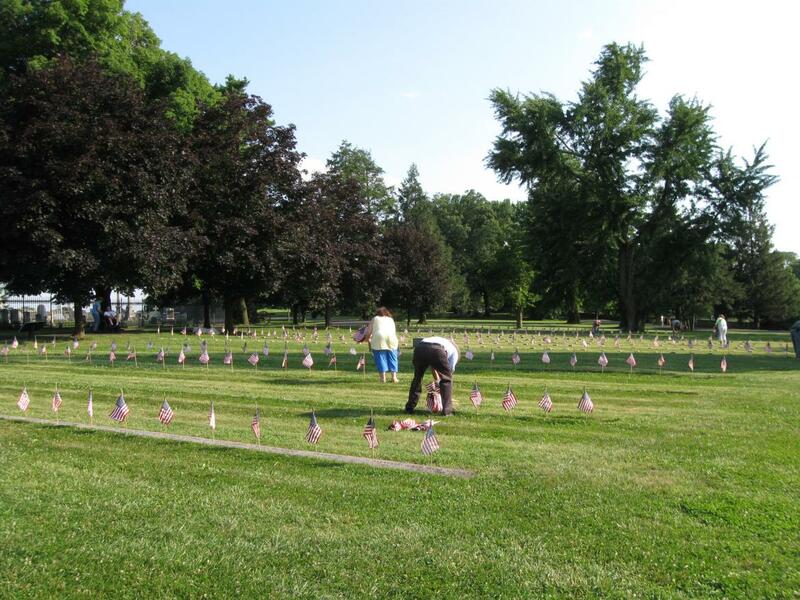 The Boy Scouts place the flags here for Memorial Day. 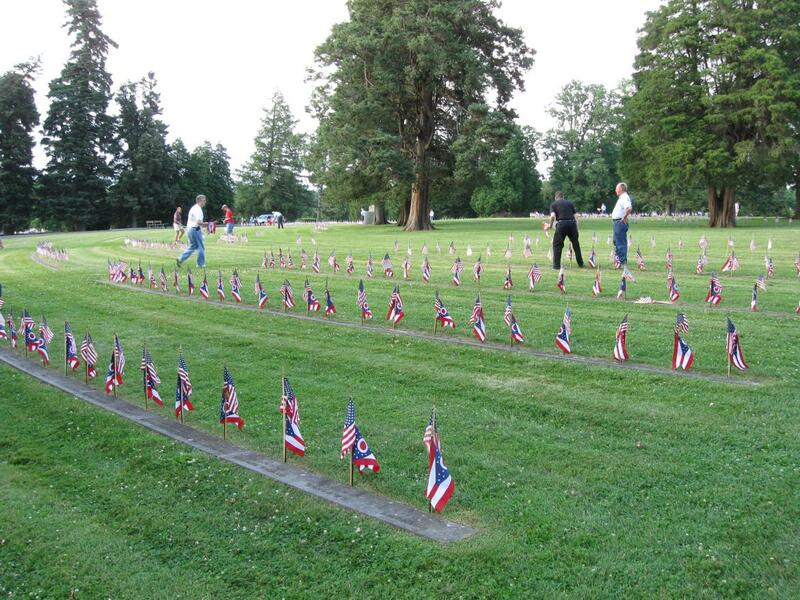 The Friends of the National Parks at Gettysburg place the flags for November 19th, the anniversary of the dedication of the cemetery. 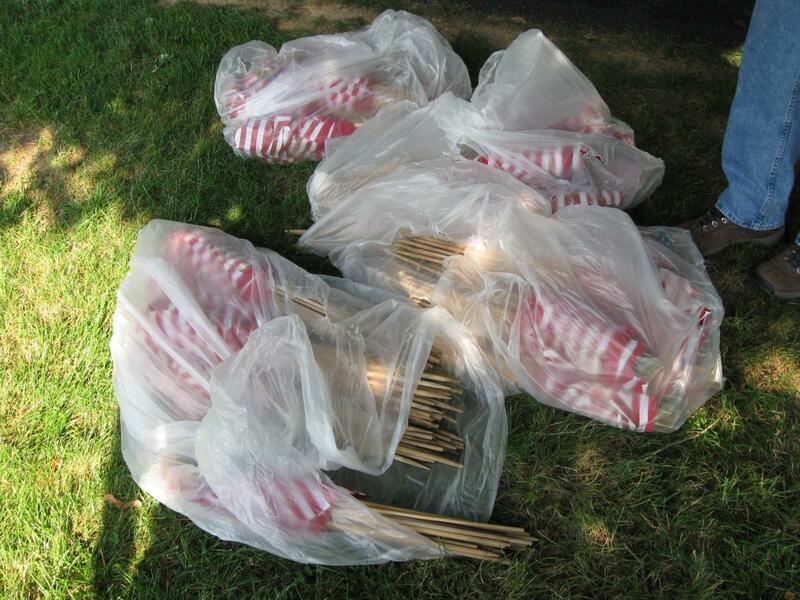 Anyone who would like to volunteer to help pull the flags up, please show up this Saturday, July 4th at 6:00 PM. 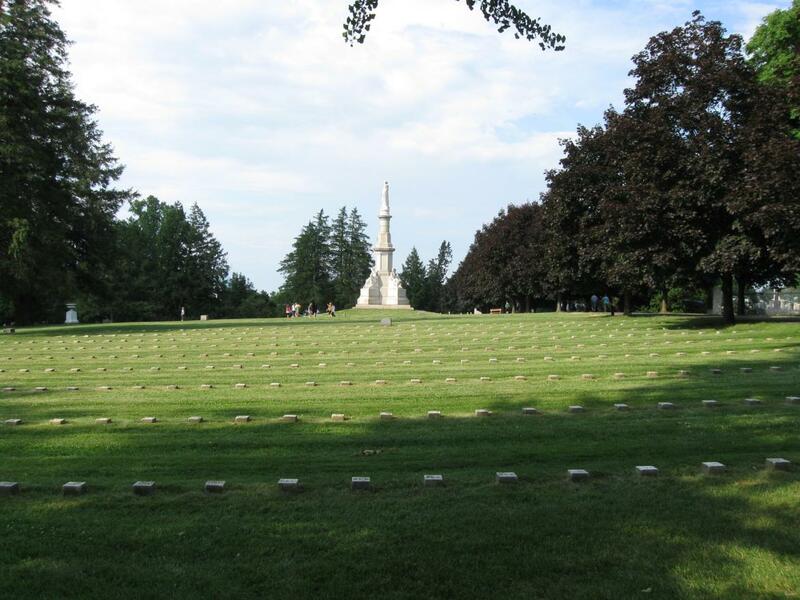 A map of the Soldiers National Cemetery/Gettysburg National Cemetery. 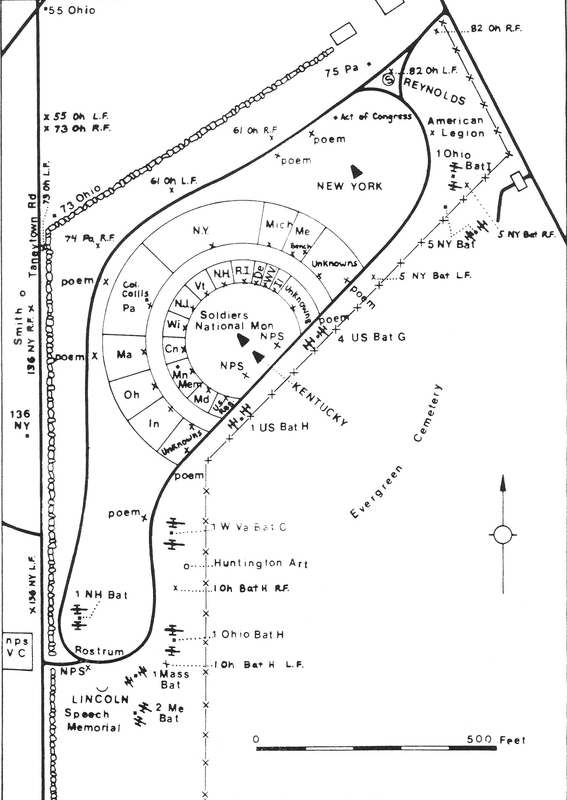 This map was scanned facing north at approximately 8:30 PM on Tuesday, June 30, 2009. 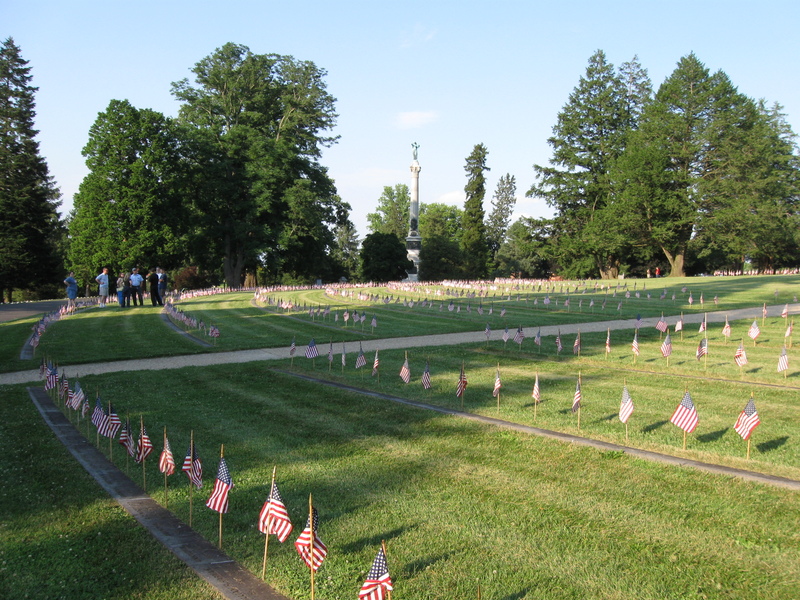 It was a beautiful evening in the National Cemetery approximately a half hour before the flags were placed. 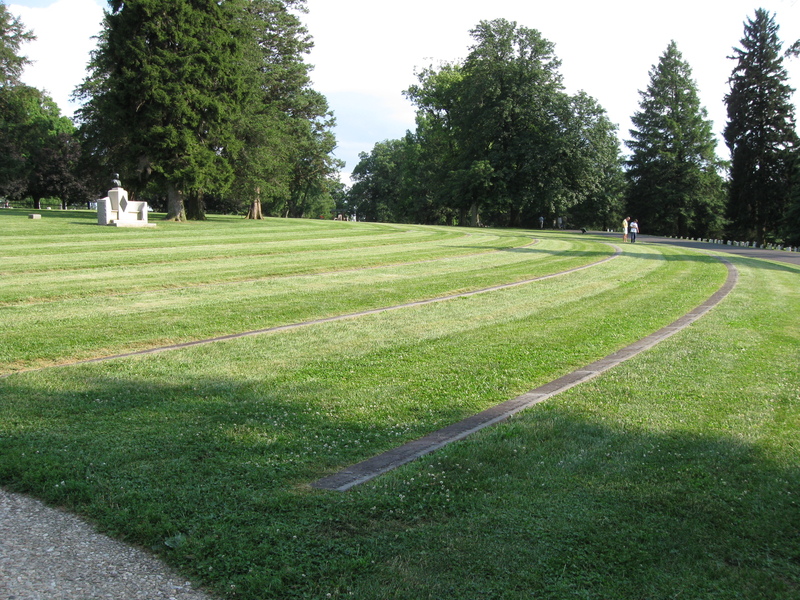 The stones in the foreground are one of the unknown sections. 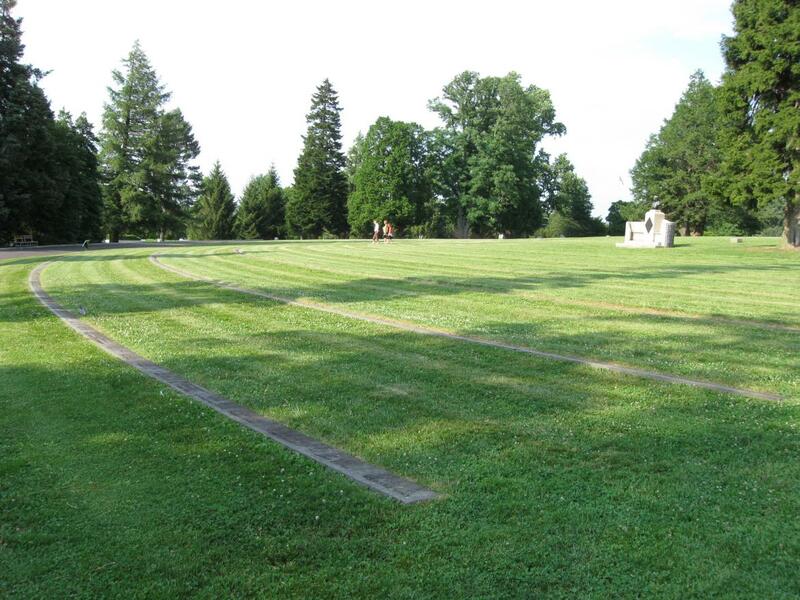 This view was taken facing southeast at approximately 5:30 PM on Tuesday, June 30, 2009. 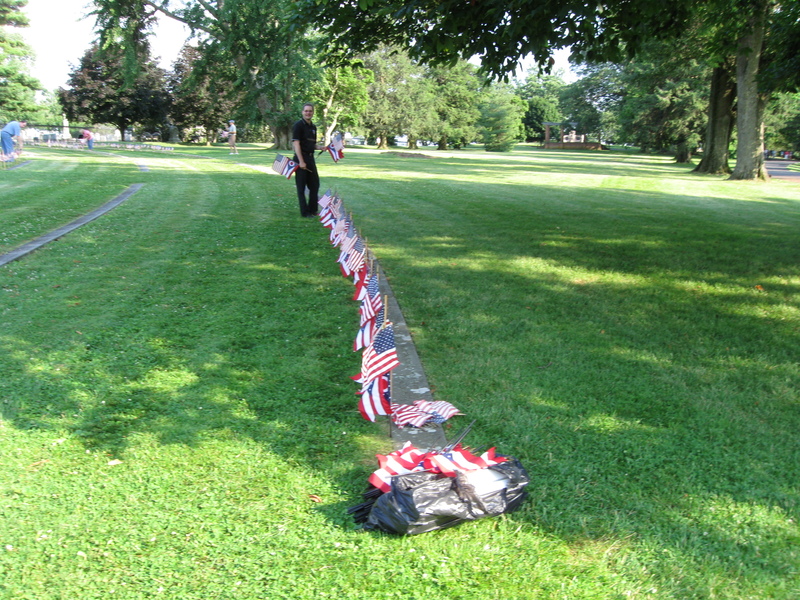 The placing of the flags was not supposed to begin until 6:00, but two individuals showed up early in the Ohio section. This view was taken facing southwest at approximately 5:40 PM on Tuesday, June 30, 2009. 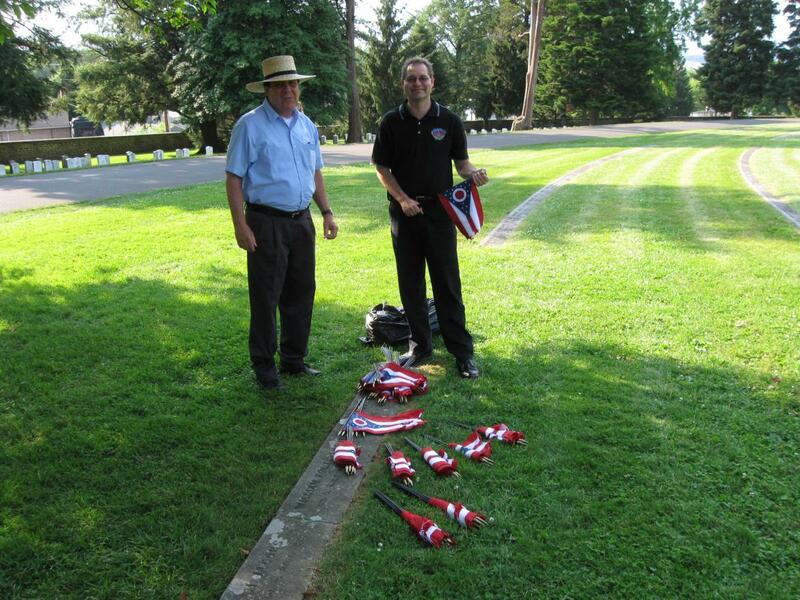 Licensed Battlefield Guides Steve Slaughter on the left and Wayne Motts on the right brought their own flags. Steve is from Maryland. Wayne is from Ohio. This view was taken facing northwest at approximately 5:40 PM on Tuesday, June 30, 2009. 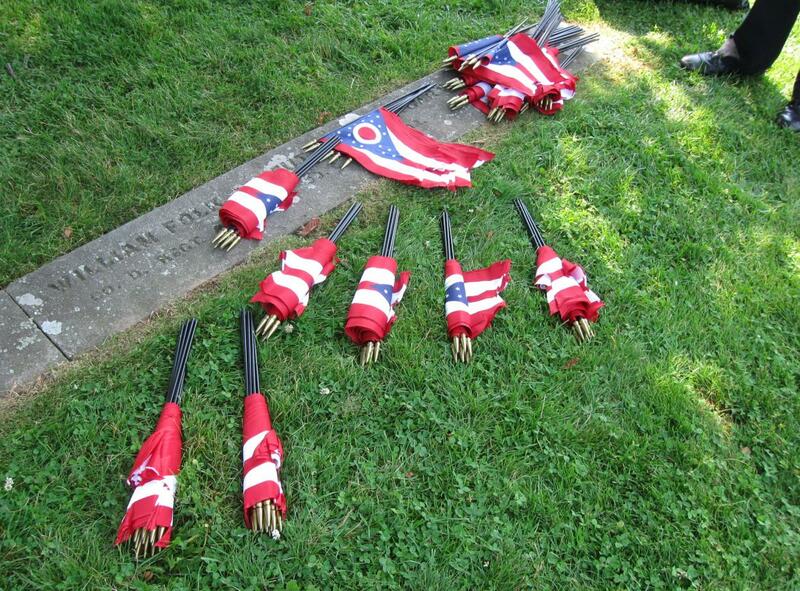 The Ohio State Flags. This view was taken facing northwest at approximately 5:40 PM on Tuesday, June 30, 2009. 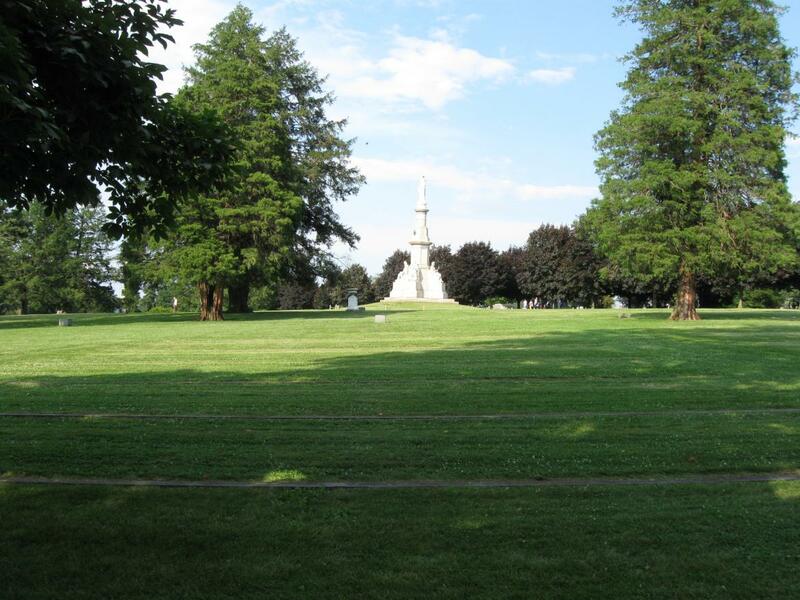 A couple of minutes later Association of Licensed Battlefield Guide Roy Frampton and his vehicle arrived at the “top” of the cemetery near the Soldiers National Monument. LBG John Sullivan and his daughter, Molly are on the right. This view was taken facing southeast at approximately 5:45 PM on Tuesday, June 30, 2009. 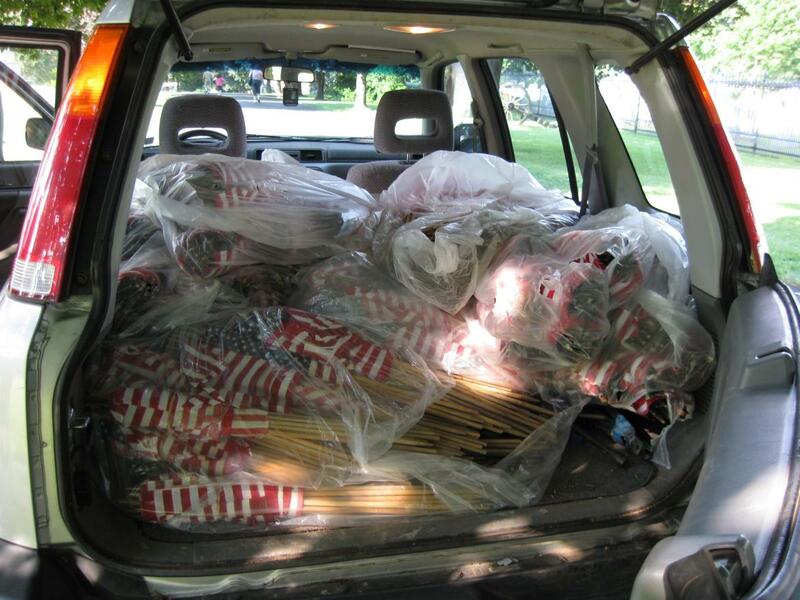 LBG Roy Frampton picked up the flags from the National Park Service. This view was taken facing southeast at approximately 5:45 PM on Tuesday, June 30, 2009. 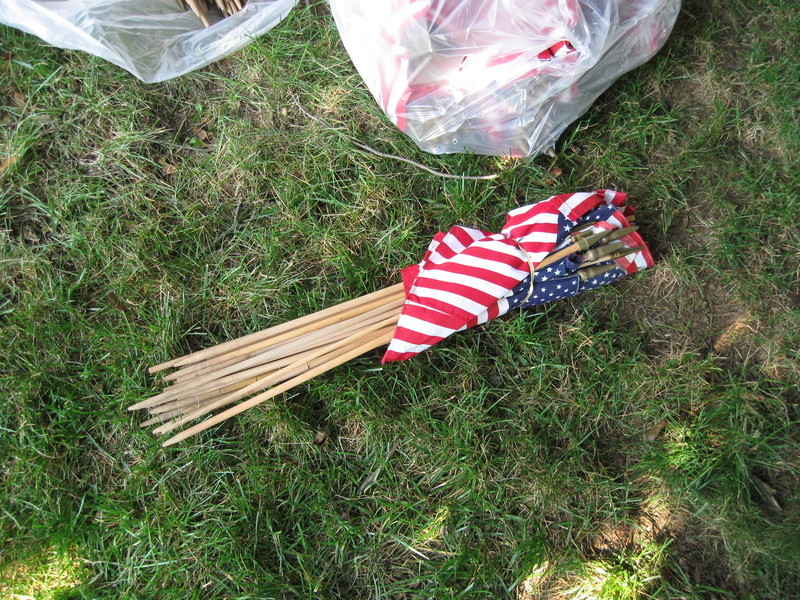 One of the first warnings one gets before they put out the flags is to save the rubber bands. This view was taken facing northeast at approximately 5:45 PM on Tuesday, June 30, 2009. 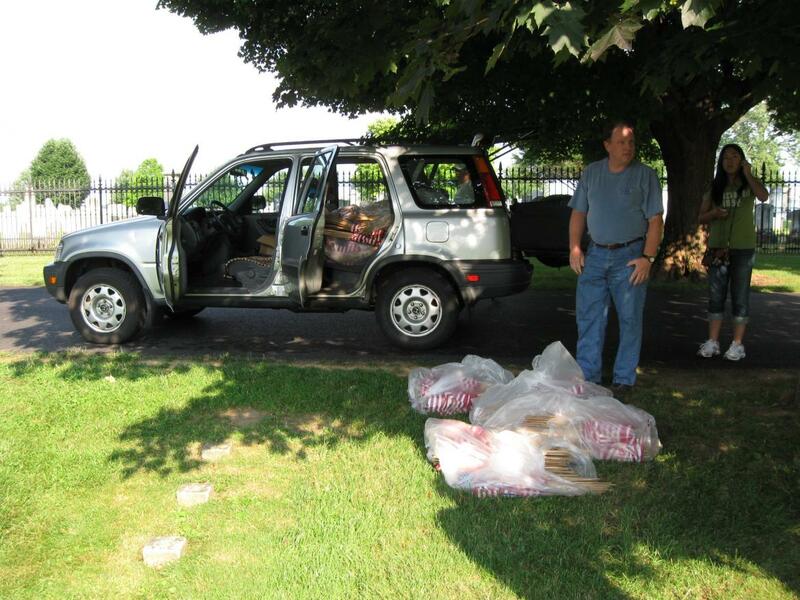 Because Roy has been doing this for a long time, experience has taught him not to unload everything out of his vehicle at this spot. 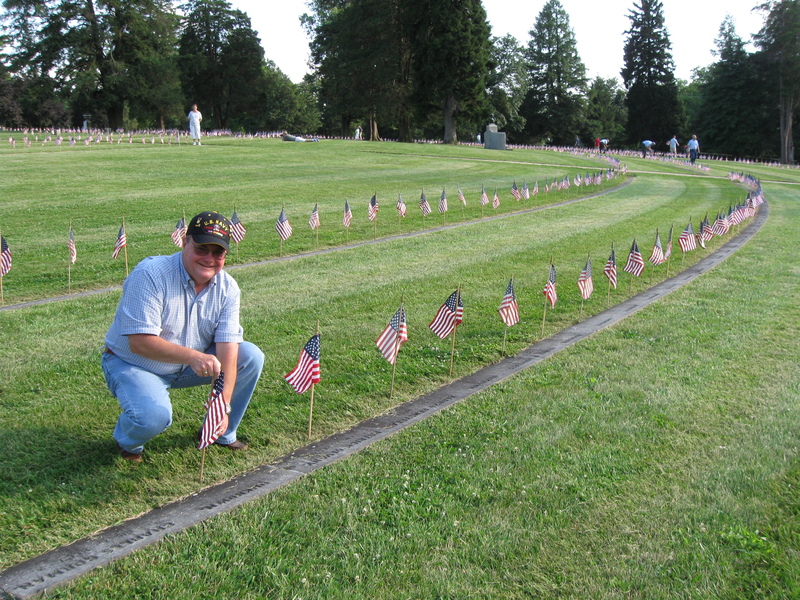 He would drive his vehicle to different points in the cemetery and drop off the flags. This view was taken facing northeast at approximately 5:45 PM on Tuesday, June 30, 2009. 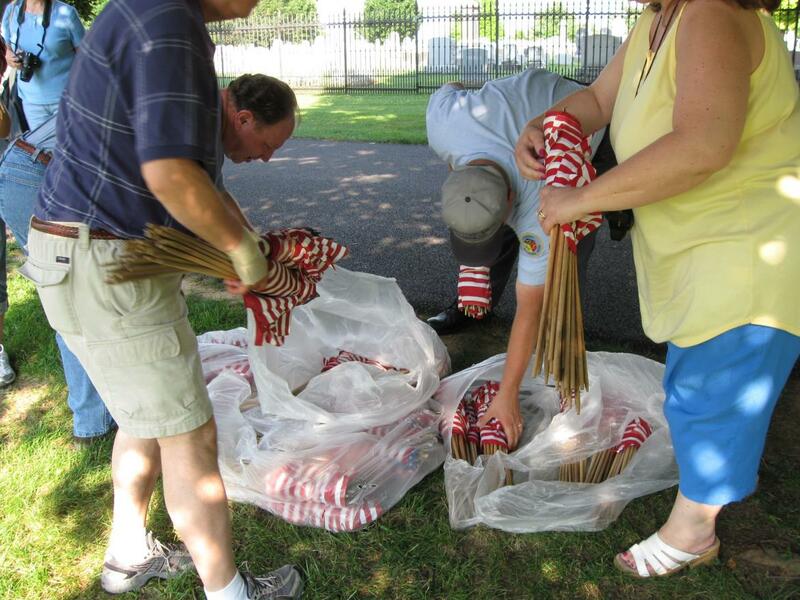 More of the guides and their friends/families arrived and they began to unpack the flags. 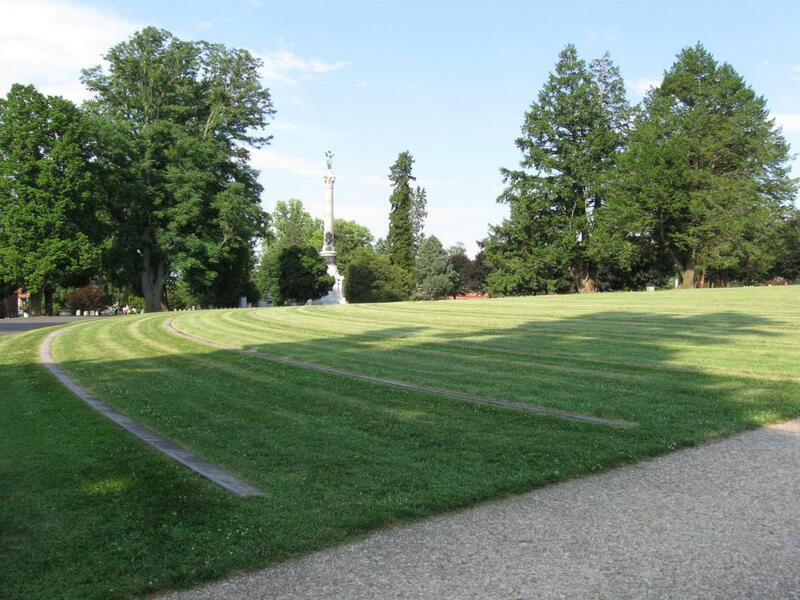 This view was taken facing southeast at approximately 5:50 PM on Tuesday, June 30, 2009. 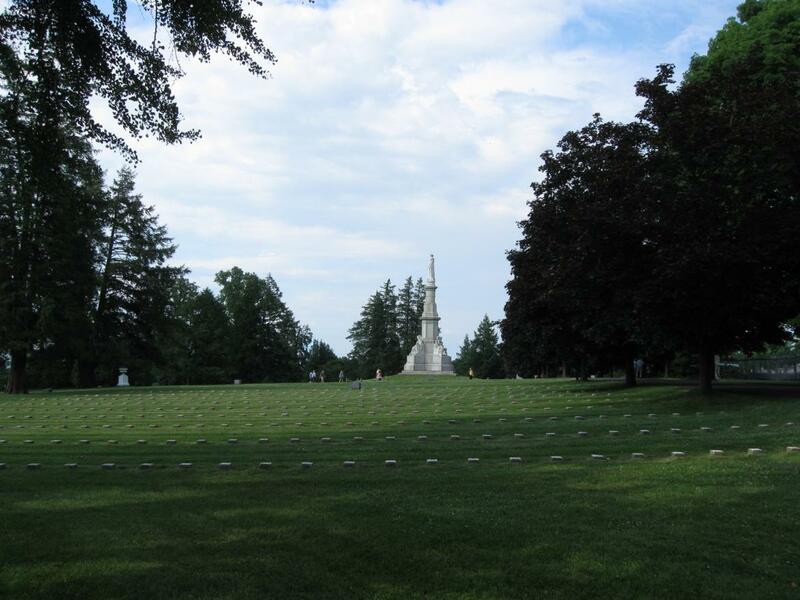 Because President Frampton told the participants that it might start raining, and if they wanted to get an early start to go ahead, a few people began on the U.S. Regulars and the unknown section at the south end of the Civil War graves. This view was taken facing east at approximately 5:50 PM on Tuesday, June 30, 2009. 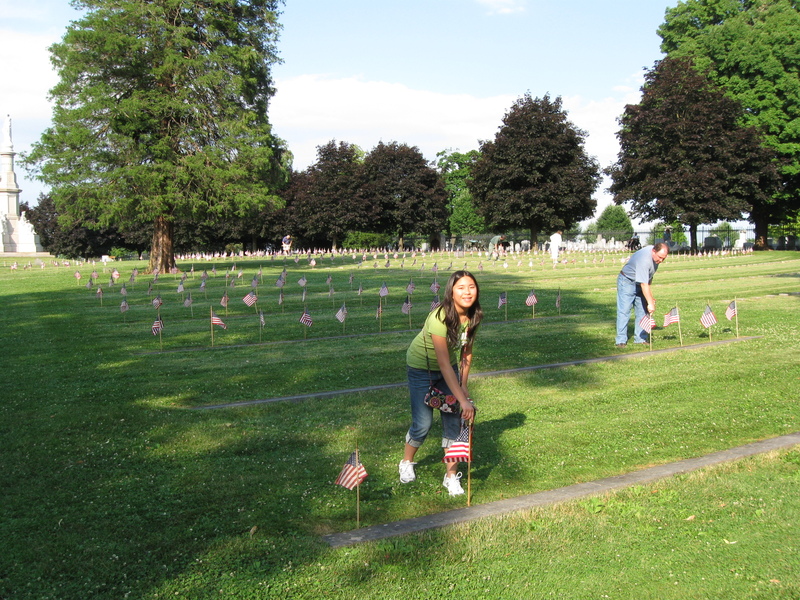 For future reference, the flags are planted in front of the headstones. This view was taken facing east at approximately 5:50 PM on Tuesday, June 30, 2009. 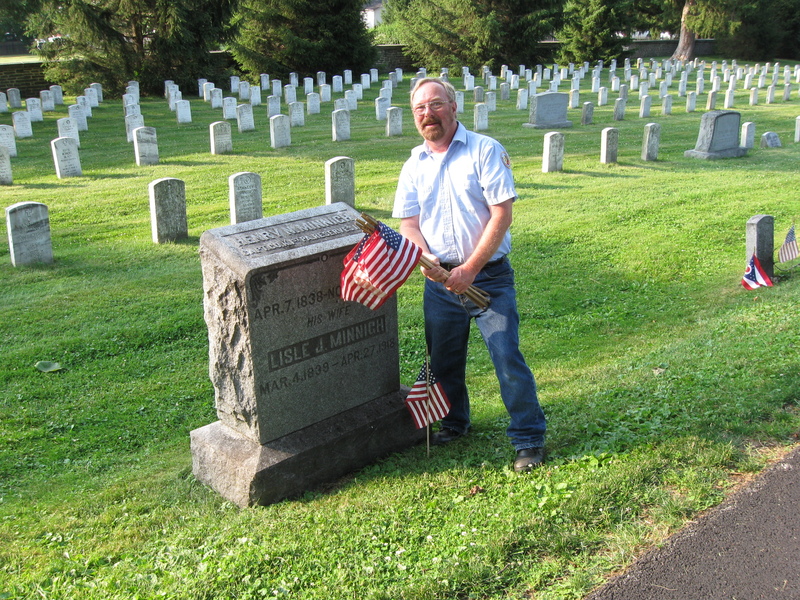 Among the participants was Licensed Battlefield Guide Dave Hamacher shown here in the U.S. Regulars section. This view was taken facing east at approximately 5:50 PM on Tuesday, June 30, 2009. 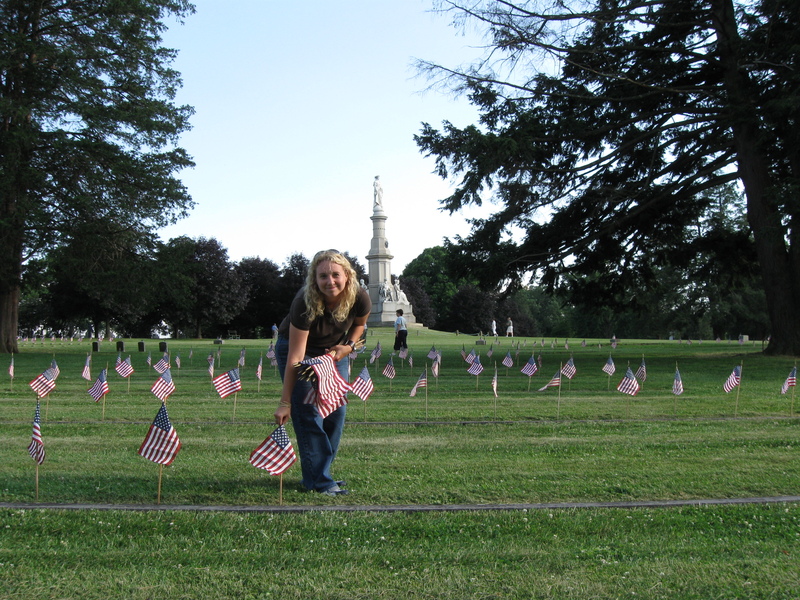 In the Connecticut Section, blue flags began to appear. This view was taken facing northwest at approximately 5:50 PM on Tuesday, June 30, 2009. 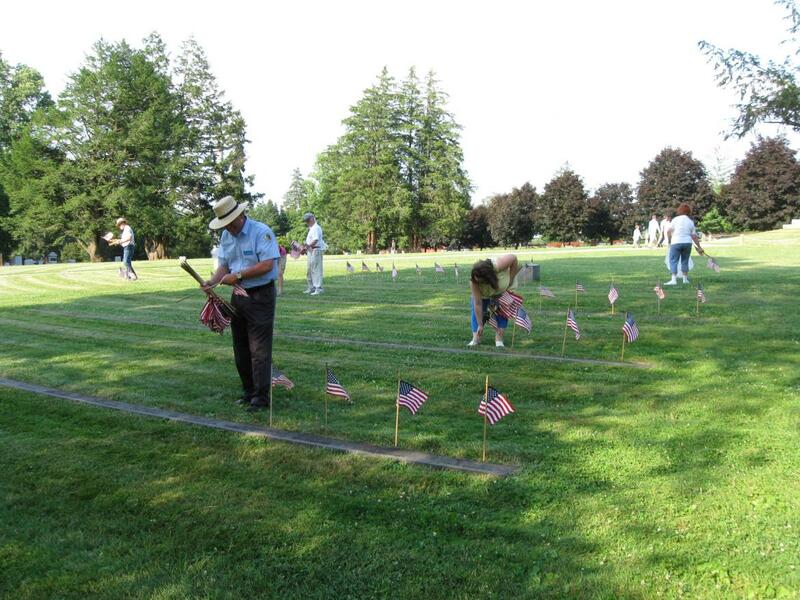 Licensed Battlefield Guide Jim Connery, his wife Barbara, and his granddaughter, Kaitlyn, brought the State of Connecticut flags. This view was taken facing northwest at approximately 5:50 PM on Tuesday, June 30, 2009. 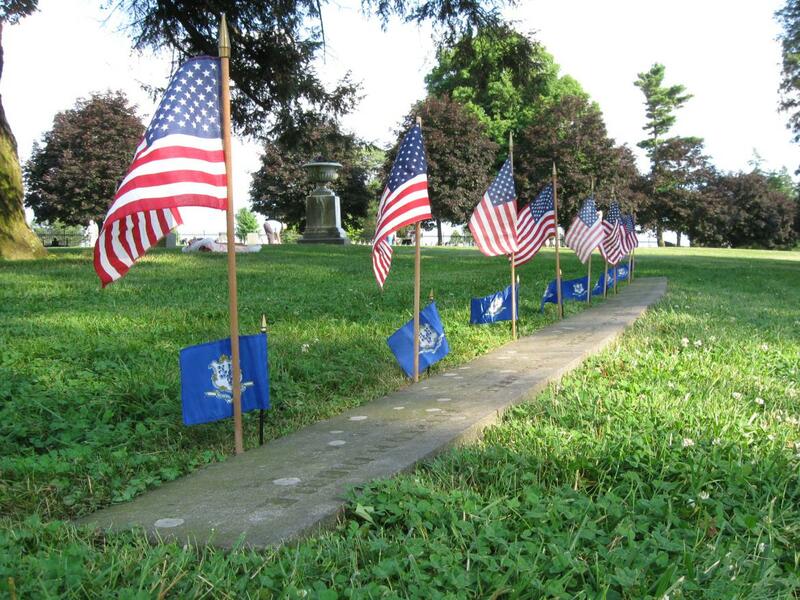 The United States flags were added a little later. This view was taken facing southeast at approximately 5:50 PM on Tuesday, June 30, 2009. 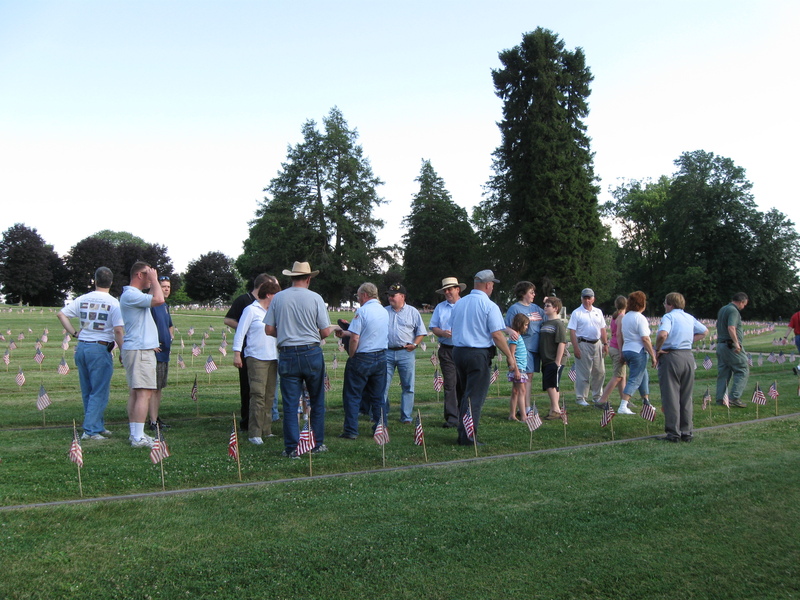 While progress was being made in the U.S. Regulars and Unknown section… This view was taken facing southeast at approximately 5:50 PM on Tuesday, June 30, 2009. …Wayne Motts was making progress in the Ohio section trying to put in both the Ohio State and the United States flags. 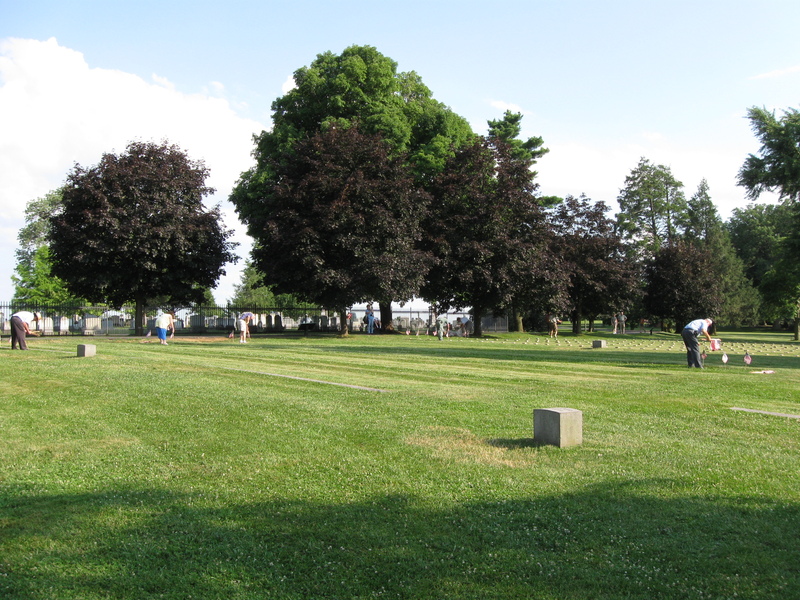 This view was taken facing southeast at approximately 5:55 PM on Tuesday, June 30, 2009. Licensed Battlefield Guide John Sullivan is in the Indiana Section. This view was taken facing northeast at approximately 5:55 PM on Tuesday, June 30, 2009. 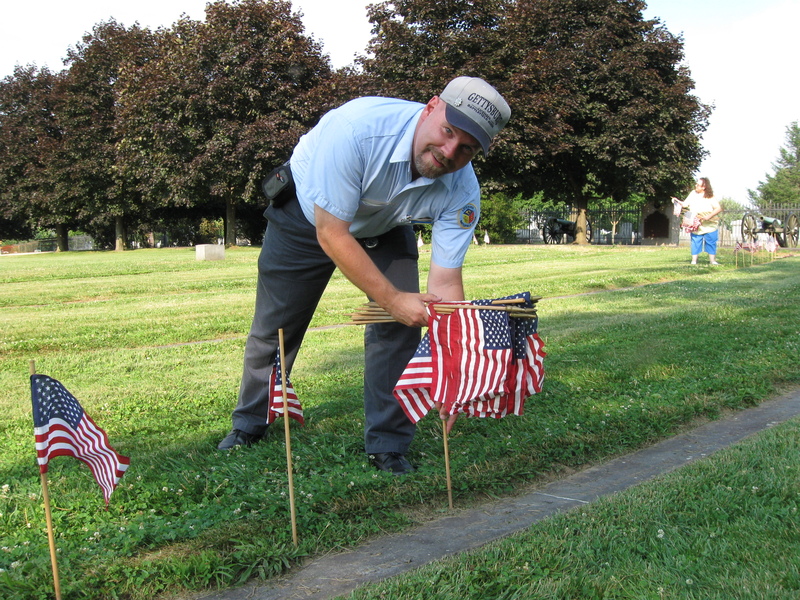 His daughter Molly has been helping place flags here since she was three years old. This view was taken facing northeast at approximately 5:55 PM on Tuesday, June 30, 2009. This group of reinforcements arrived just before 6:00 PM. John Winkleman on the left is checking his watch and wondering why everything started so early. This view was taken facing southwest at approximately 5:55 PM on Tuesday, June 30, 2009. 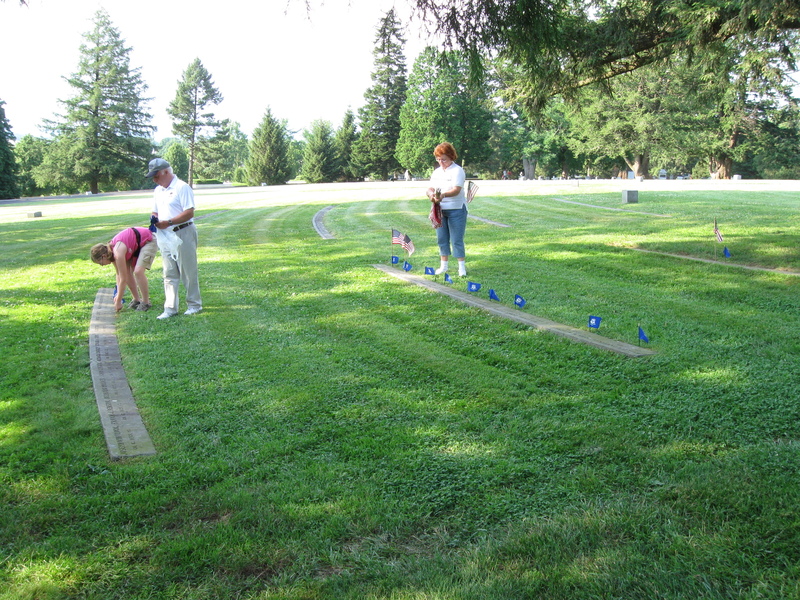 By 6:00 PM the participants started on the Pennsylvania Section. This view was taken facing northeast at approximately 6:00 PM on Tuesday, June 30, 2009. Dave Donahue, here in the Pennsylvania Section, was one of the first year LBGs who showed up. This view was taken facing southeast at approximately 6:00 PM on Tuesday, June 30, 2009. For some reason, people wanted to help out Wayne Motts in the Ohio section, including Michael Waricher, in the blue shirt, kneeling on the left, and Paul Bailey in the white short and khaki shorts standing on the right. This view was taken facing northeast at approximately 6:00 PM on Tuesday, June 30, 2009. 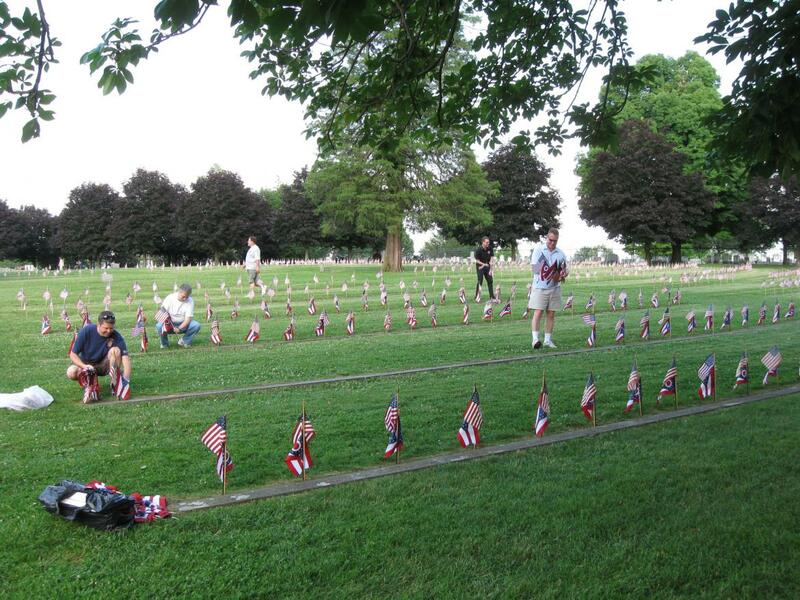 But Wayne’s Ohio Section was looking really good. This view was taken facing north at approximately 6:00 PM on Tuesday, June 30, 2009. 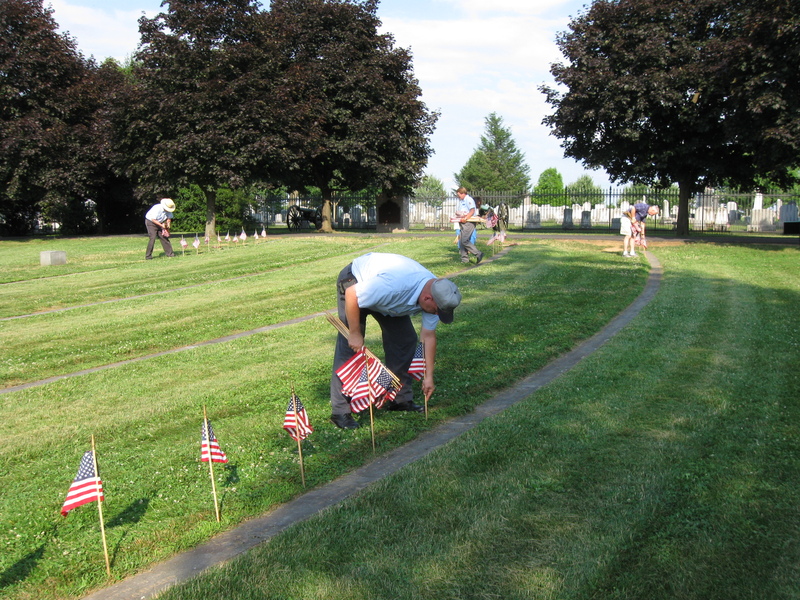 Others who showed up included LBG and Vietnam Veteran John Winkleman, shown here in the New York Section. This view was taken facing southwest at approximately 6:00 PM on Tuesday, June 30, 2009. LBG Kim Hamacher is shown in the New York Section. This view was taken facing southwest at approximately 6:00 PM on Tuesday, June 30, 2009. First year LBG Christina Moon is in the Michigan Section. 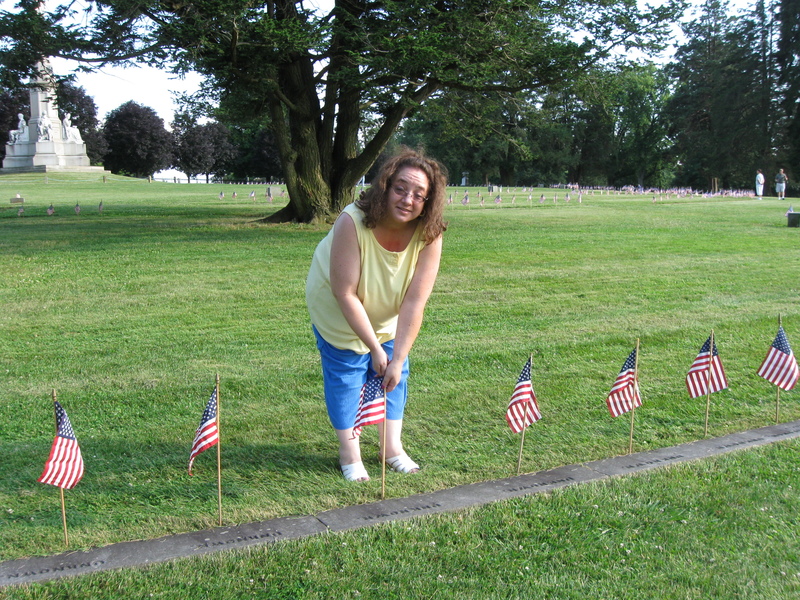 She told us this was her second year putting out the flags. This view was taken facing south at approximately 6:00 PM on Tuesday, June 30, 2009. LBG Deb Novotny is in the northern most Unknown Section of the Civil War graves. This view was taken facing northeast at approximately 6:00 PM on Tuesday, June 30, 2009. Other children stopped by to help. 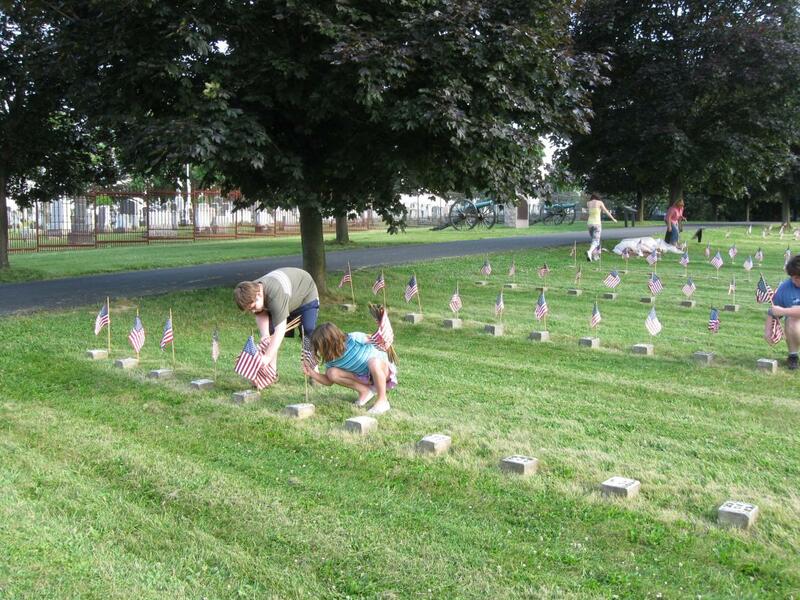 These are LBG Stacy Kilts’ son Robert, and daughter, Margaret, placing flags in the first Unknown Section northeast of the Soldiers National Monument. This view was taken facing southeast at approximately 6:00 PM on Tuesday, June 30, 2009. By approximately 6:15 PM progress was being made. Here are the Unknown Sections in the foreground and the New York State Monument in the background around 5:30 PM. 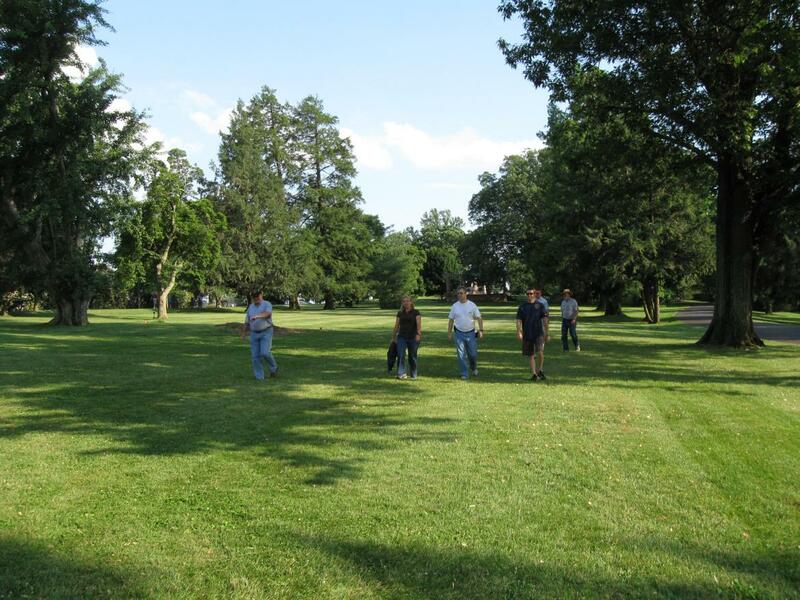 This view was taken facing northeast at approximately 5:30 PM on Tuesday, June 30, 2009. Here they are by 6:15. This view was taken facing northeast at approximately 6:15 PM on Tuesday, June 30, 2009. By 6:20 everyone was gathering in the Pennsylvania and New York Sections to finish. This view was taken facing northeast at approximately 6:20 PM on Tuesday, June 30, 2009. 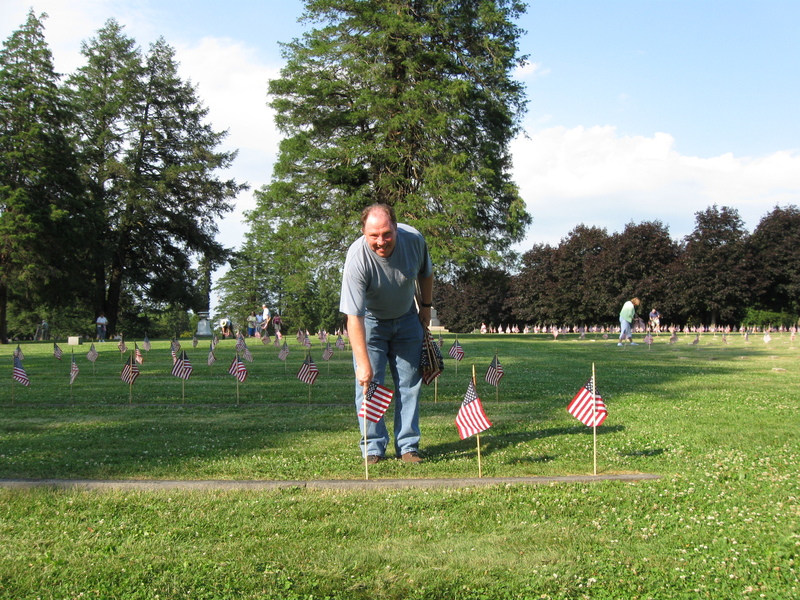 Association of Licensed Battlefield Guides President Roy Frampton makes sure he puts a flag at the graves of other Civil War veterans buried in the National Cemetery, such as Gettysburg native Henry Minnigh. This view was taken facing north at approximately 6:20 PM on Tuesday, June 30, 2009. By 6:30 everyone was finished. This is the New York Section. This view was taken facing southwest at approximately 6:30 PM on Tuesday, June 30, 2009. 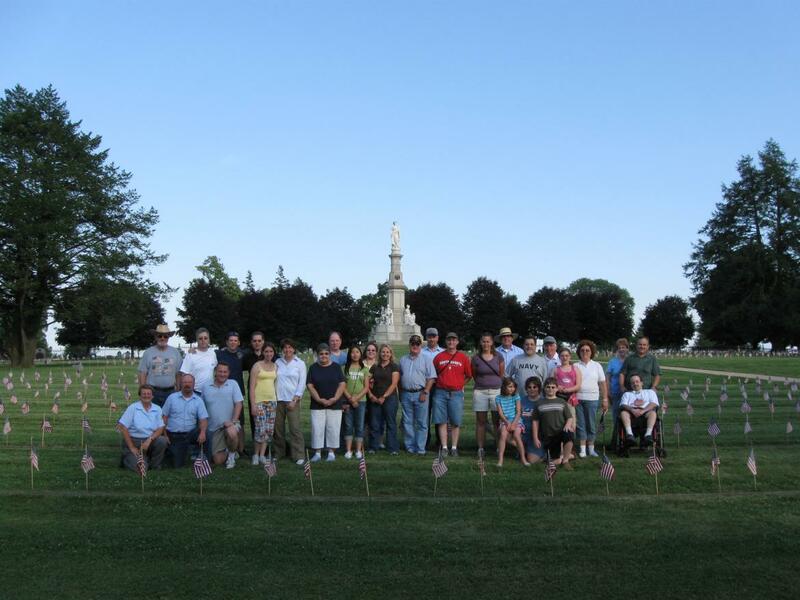 It was time to take a group picture… This view was taken facing southeast at approximately 6:30 PM on Tuesday, June 30, 2009. …and say goodbye. This view was taken facing southeast at approximately 6:30 PM on Tuesday, June 30, 2009. Let’s review some of what was accomplished. 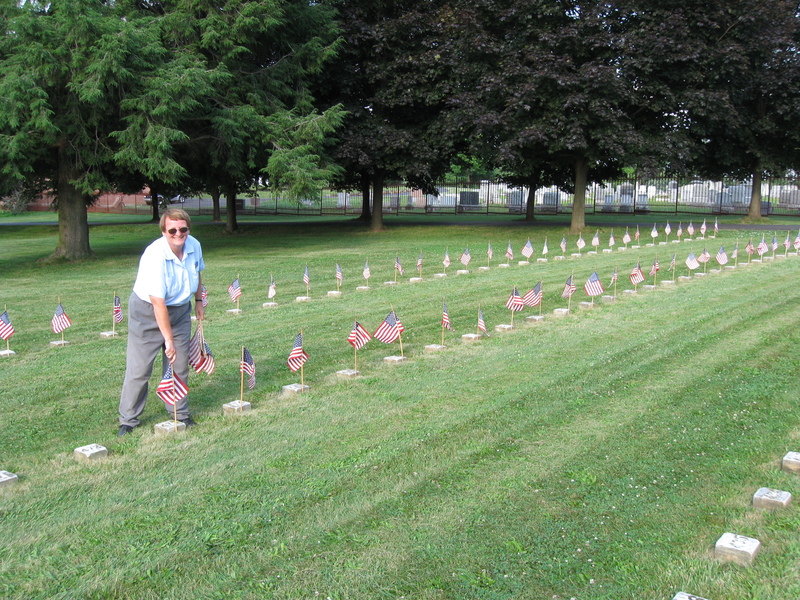 Here’s the Unknown Section on the south side of the Soldiers National Monument. This view was taken facing northeast at approximately 5:30 PM on Tuesday, June 30, 2009. 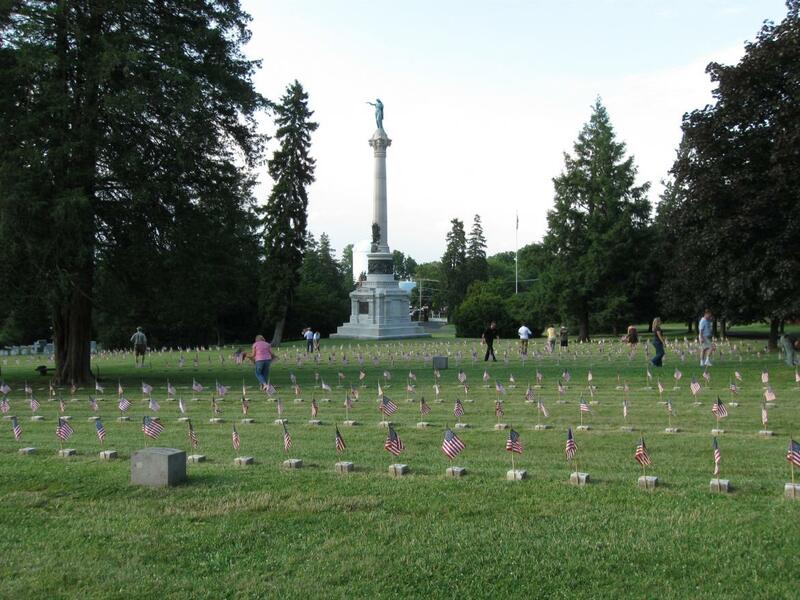 Here’s the Unknown Section on the south side of the Soldiers National Monument. This view was taken facing northeast at approximately 6:30 PM on Tuesday, June 30, 2009. 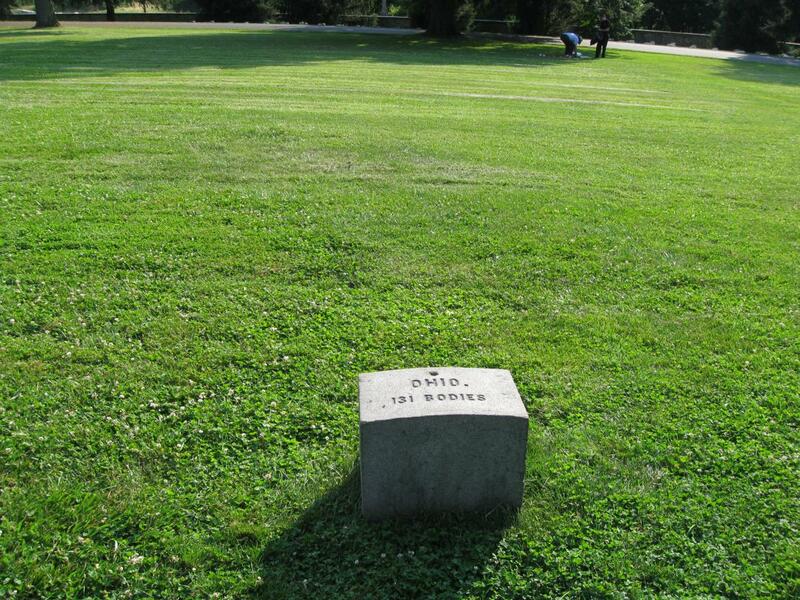 The Ohio Section at 5:30. This view was taken facing northeast at approximately 5:30 PM on Tuesday, June 30, 2009. The Ohio Section at 6:30. This view was taken facing northeast at approximately 6:30 PM on Tuesday, June 30, 2009. 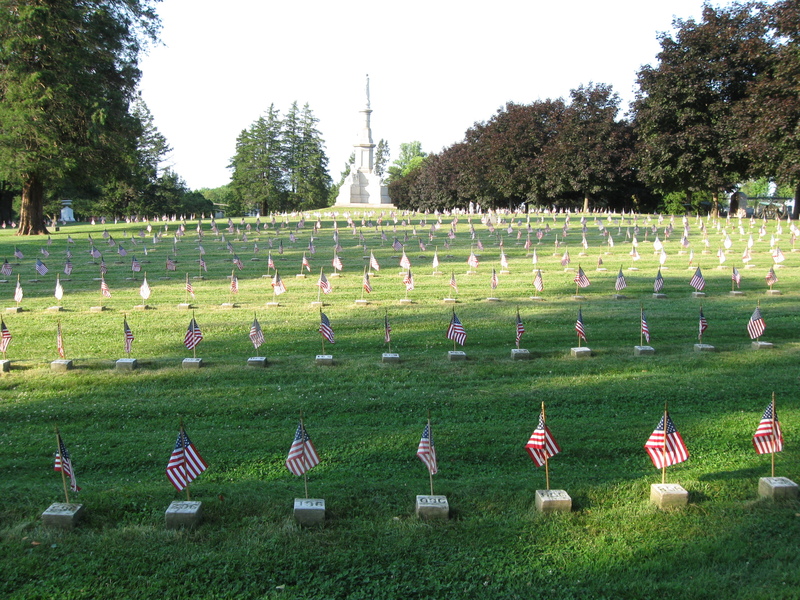 The southwest corner of the Pennsylvania Section at 5:30. This view was taken facing northeast at approximately 5:30 PM on Tuesday, June 30, 2009. 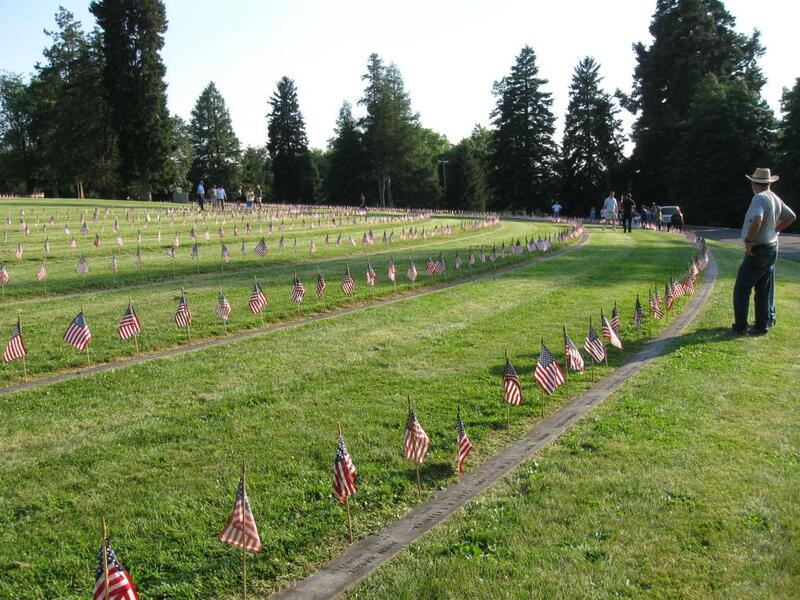 The southwest corner of the Pennsylvania Section at 6:30. This view was taken facing northeast at approximately 6:30 PM on Tuesday, June 30, 2009. 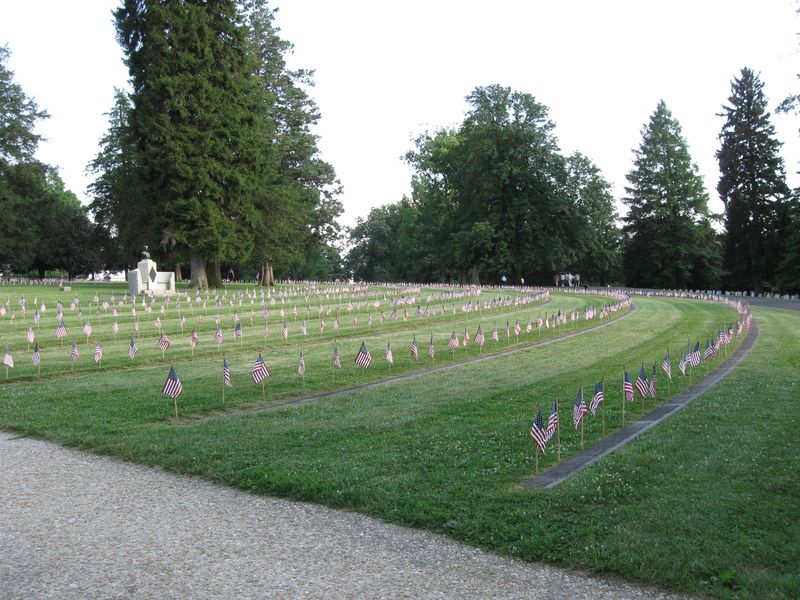 The Pennsylvania Section with the Collis Monument on the right at 5:30. This view was taken facing southeast at approximately 5:30 PM on Tuesday, June 30, 2009. 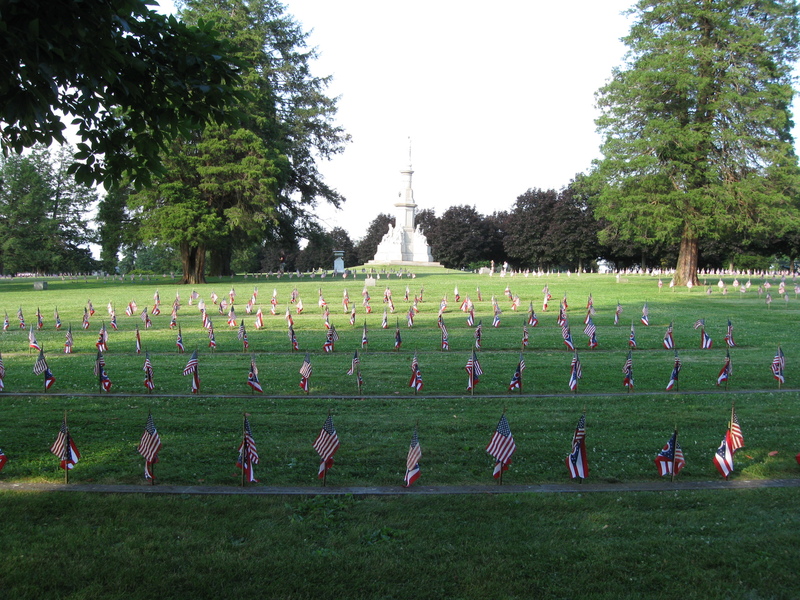 The Pennsylvania Section with the Collis Monument on the right at 6:30. This view was taken facing southeast at approximately 6:30 PM on Tuesday, June 30, 2009. 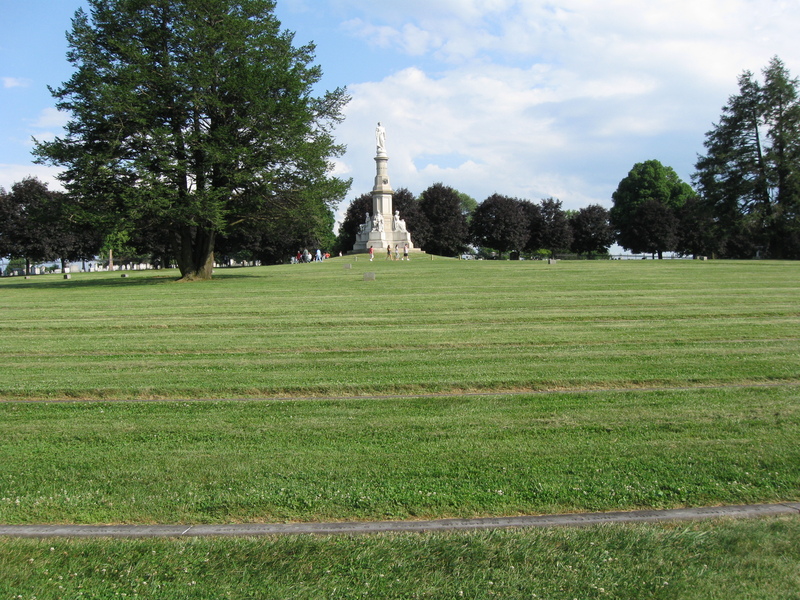 The north corner of the Pennsylvania Section with the Collis Monument on the left at 5:30. This view was taken facing south at approximately 5:30 PM on Tuesday, June 30, 2009. 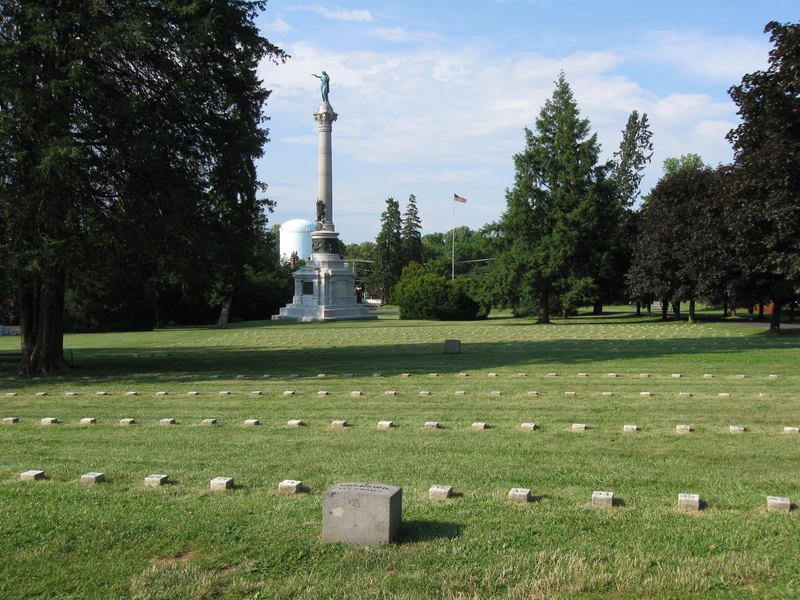 The north corner of the Pennsylvania Section with the Collis Monument on the left at 6:30. This view was taken facing south at approximately 6:30 PM on Tuesday, June 30, 2009. 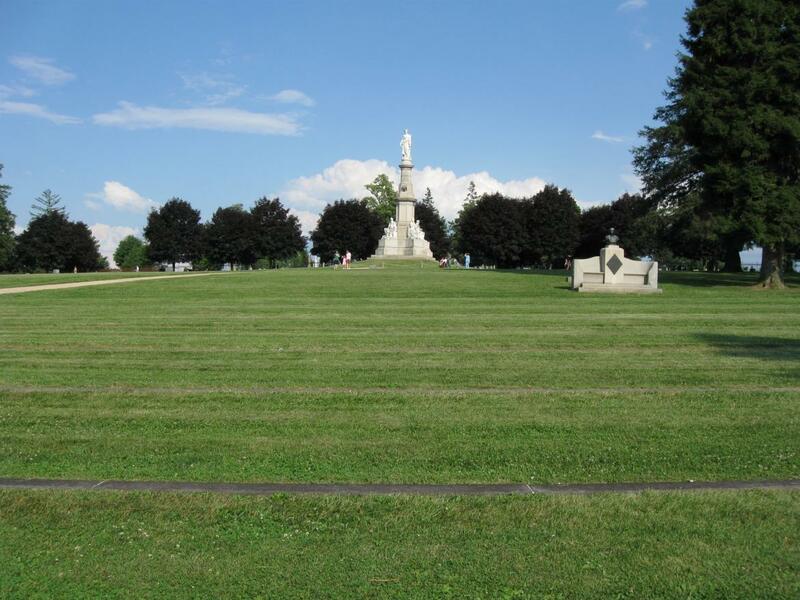 Looking across the New York Section to the New York State Monument at 5:30. This view was taken facing northeast at approximately 5:30 PM on Tuesday, June 30, 2009. 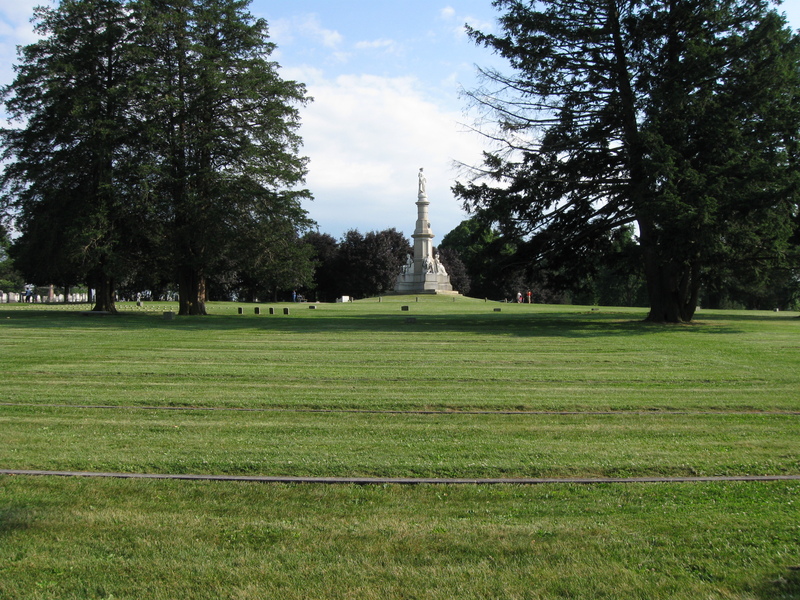 Looking across the New York Section (and part of the Pennsylvania Section) to the New York State Monument at 6:30. This view was taken facing northeast at approximately 6:30 PM on Tuesday, June 30, 2009. 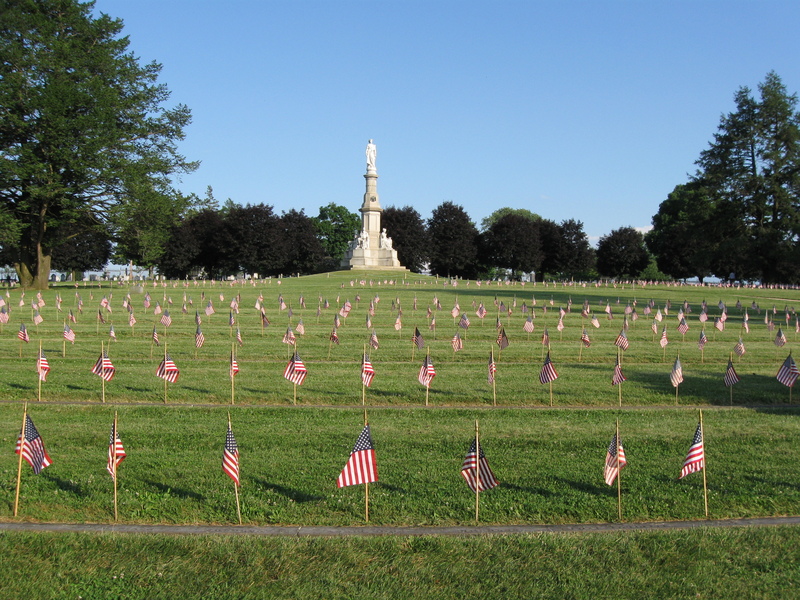 Looking across the New York Section to the Soldiers National Monument at 5:30. This view was taken facing southeast at approximately 5:30 PM on Tuesday, June 30, 2009. 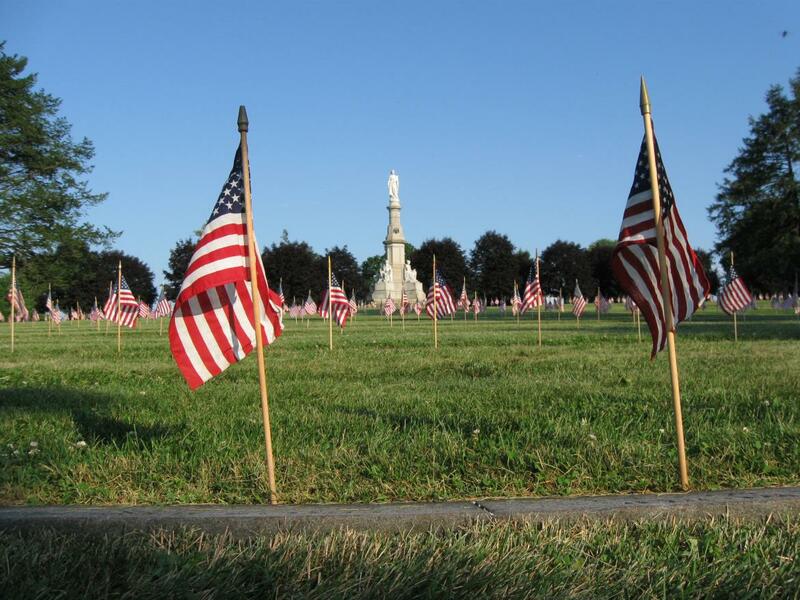 Looking across the New York Section to the Soldiers National Monument at 6:30. This view was taken facing southeast at approximately 6:30 PM on Tuesday, June 30, 2009. The Michigan Section at 5:30. This view was taken facing southeast at approximately 5:30 PM on Tuesday, June 30, 2009. The Michigan Section at 6:30. This view was taken facing southeast at approximately 6:30 PM on Tuesday, June 30, 2009. 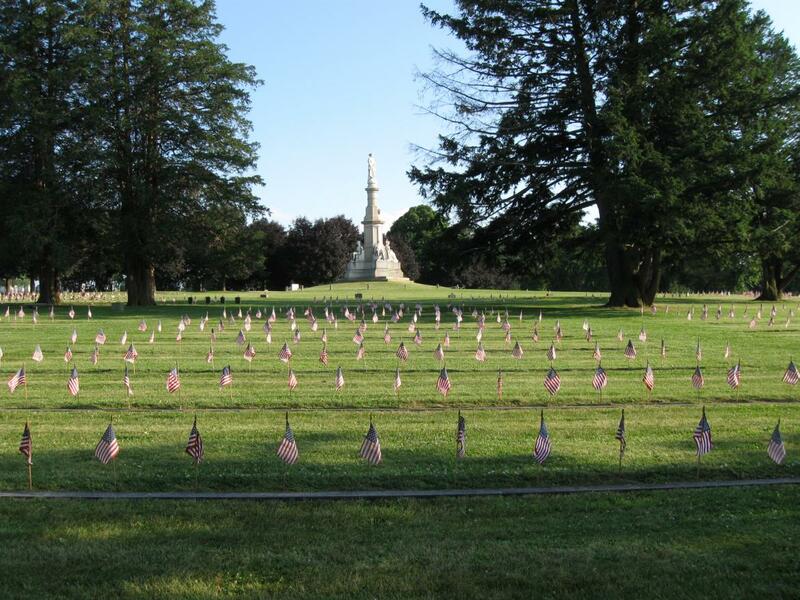 To see posts by Gettysburg Licensed Battlefield Guides, click here.